The world really is going to hell in a soup tureen. Yep, you heard me. According to a recent survey (hey, I don't make these thing up) good table manners have become a thing of the past. Horror of hors d-oeuvres, can you imagine? Personally, I think Colonel Sanders and his finger lickin' good chicken is to blame for the downfall of civil mastication. On the upside he saved us all from washing the utensils over and over again. But I digress. 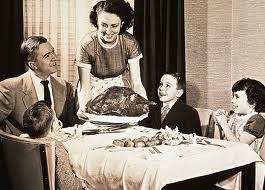 A study of British diners by Bisto found that a quarter of people surveyed believe table manners are not important. Oh, British dinners. Have you seen the food they eat? When you subsist on a diet of bangers and mash that could help explain things. Listen to this. 44% of those polled say they start their food before others arrive at the table. Another 38% regularly answer phone calls while they are eating. Why? Don't they know it's just a telemarketer at the other end of the line? This number does not include my wife who would be among the per cent of people who read e-mails on their blackberries during a meal. What? I'm not entertaining enough? I digress again. 33% admitted to not thinking twice about stealing food off other people's plates. Here's a few things that weren't included in the survey - some food faux pas as it were - although they've been known to happen in my house, and I'd be curious to know how prevalent these activities are. Loading up with salt and pepper without tasting your meal. The old border-house reach as opposed to "Could you please pass the brussel sprouts." Lifting the soup bowl to one's lips to sip the last drop of pottage. Licking of the dinner plate. Putting your plate on the floor so the family dog can clean up your leftovers. Scraping the vegetables you don't like onto your spouse's plate when they're not looking. Eating ribs, drumsticks or refried beans with your fingers. Loud, satisfied passings of air out of any number of orifices without so much as an "Oops, excuse me" or "Ah, now that was good, dear." I confess except for feeding food to the dog, as we don't have one, I have at one time or another (hey not at the same meal, what do you think I am?) undertaken all of these. Miss Manners would roll over in her grave...if she were dead. And if she's not, she wouldn't last long at my house. TABLE Manners? You mean people actually sit at a table to eat? Away from the television? Brutal! Boom Boom: Yeah, I know! That's a whole other post. I had some humorous memories when you mentioned this was a British poll because it reminded me of my first trip to England. I didnt know that if you sit down in a cafe by yourself, and all the other seats are taken, someone else who is alone will come and ask if they can sit with you. I didn't mind, I just had no idea what politeness dictated in terms of chatting. Plus, I'd been awake about 27 hours at that point so I had kind of a fugue episode and probably talked entirely too much. If anyone stole food off my plate, they would lose a limb. This is why I live and prefer to eat alone. I like food more than I like most people, so it works out well. What seems to be the problem Nomie? One time at a dinner meeting, one of my colleagues phone began to ring. She didn't answer it and just let it ring. She nervously said she would check the voice mail afterward. Seven days later, she was dead. SM96: Well that's just plain rude. You're there to eat, not have to listen to some goober mouth off. Cross "visit English pubs" off my bucket list. Abby: And I was going to see if you were free for lunch next week. Forget it. You have issues. Georgina: Ten to two? I always did twenty after twelve. Oh my God. All this time I've committed a fashion faux pas. How about this? My wife turns her for over. I leave mine face up. Who is right? Quirks: Okay, I think we were separated at birth. LOTGK: That'll teach her. Although I don't know if it has to do with what she ate or the phone message she finally checked. But that'll teach her any way. This is where I get on my soapbox... people don't have manners anymore because their parents didn't take the time to teach it to them. My parents INSISTED on good table manners (no elbows on the table, NOT chewing with your mouth open, waiting till everyone was served to eat, teaching us which utensils to use, behaving in public restarants, ect). Brooke Amanda: Mine insisted on good manners too. What can I say? I'm a *burp* rebel. Since when is it unacceptable to eat ribs or chicken with your hands? I think it should be mandated by law to eat them that way. I distinctly remember my Aunt Lala, who was British, repeatedly whacking my knuckles with a spoon because I kept putting my elbows on the dinner table. Man, have times ever changed. Mike: The refried beans is going a little far. But they can be finger lickin' good. The worst for me is watching someone chew with their mouth open. I was always after my kids to close their mouths when they eat. Of course it's harder to get the fork in that way. Much like Brooke Amanda, my parents also INSISTED on good table manners, and I have passed those manners along to my son. The one thing on your list that I am terrible for doing is adding salt BEFORE I taste the food. I love salt. Can't get enough! meleah rebeccah: I can't eat salt...blood pressure. But I'm guilty with the pepper and it drives my wife to distraction. How on earth is one supposed to eat wings and/or ribs without using your fingers? Drumsticks maybe, but using your fingers for refried beans? Of course one might consider a nacho as a utensil. 00dozo: I think eating refried beans with you fingers has something to do with the number of Mexican beers you've ad with your meal. We have recently instituted a "no texting" rule at the table. Why didn't we put one in place earlier? Because it isn't the type of thing that should need to be said. Cdn. Blend: Did you have to text family members to let them know about this new rule? I was raised with manners being important. My grandpa would rap my knuckles or flick my ear for any infraction of the rules. I would never eat my food before the others food arrived nor answer my phone. Although I have been known to tweet or check my email while with my hubby because he is busy stuffing his face. I have licked my plate but only at home when no one was around to see me, therefore, it can't be proven. Hubby and I do switch food. He is less picky than me. One thing that drives me nuts is the improper way of holding the utensils. My hubby holds his wrong and every time I look at him my grandpa's voice is screaming, "What the hell do think it is? A shovel?" We, also, had to ask to be excused from the table. The rule I disagreed with was we were not allowed to leave unless we ate every bite on our plate. I was known to be at the table for hours. I blame them for my weight problems. Junebug: While visiting our nephew last summer we weaned him from the caveman approach of using utensils. In my own case, as a kid I'd be at the table for hours because I couldn't chew my meat properly. Then I'd finally skulk down the hall and spit it out into the toilet. Funny I'm not vegan. Looks like a good place to share a pet peeve on table manners. I don't like it when the person with whom I am sharing a meal with reads at the table, be it newspaper, mail, phone, etc. Also on a similar subject, what's with TVs in all the restaurants. I can understand a sports bar, but they're showing up everywhere except maybe the "fine dining" places. When I'm dining with someone, I give them my full attention, and expect the same, not to be watching TV. Hard to believe, but true. Families not sitting together at a table has a lot to do with this, too. Glad I know which fork to use, etc. Linda: Reading at the table's definitely a no-no. Unless, that is you and your hon agree to peruse the weekend papers while sharing brunch. Ha, ha, with respect to the TVs in restaurants I always try to get the chair with the great view of the big screen so I can devote equal time between the game and my loved one. Pretty considerate, eh? (The other) Linda: It doesn't happen often around here, but it's kinda nice when everyone sits down at the table for dinner. It beats the internet hands-down as a good source of information!